The HI-G dryer fines recovery system consists of a cluster of 4in unibody hydrocyclones mounted over the HI-G dryer screening unit. The system provides recovered fines that can be stacked or conveyed. 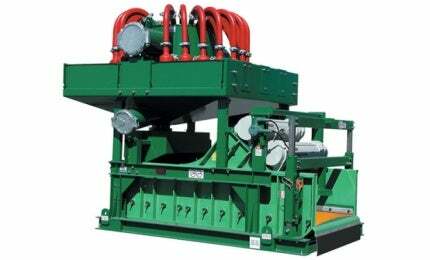 The hydrocyclones are designed to remove silt-sized solids from plant discharge slurries. The fines leaving the hydrocyclones, which are approximately between 50% and 60% solids, are fed to the dual motor, linear motion vibrating screen. Counter-rotating vibratory motors on the machine create a high G-force (greater than 7gs) that separate the liquid from the solids, removing the small amount of free water that makes the difference between materials being stackable and unstackable. The dewatered fines are discharged from the machine at 75%-80% solids. Derrick Hi-G dewatering screens, fitted with Derrick Polyweb® urethane screen panels, are successfully operating in numerous coal processing plants worldwide. Users experience significant overall cost reduction as a result of the mass load relief of downstream ultra-fines processing equipment. A recent installation led to the elimination of a tailings pond.